Haley Loftis, from Kansas City, Missouri, is project manager for UA’s EcoCAR 3 team. Haley Loftis has come a long way since beginning school at The University of Alabama in 2013. In that time, she attained a bachelor’s degree in electrical engineering, participated in multiple internships, began graduate school and, most recently, won an award for her contribution to an advanced vehicle technology competition named EcoCAR 3. Loftis came to Alabama by way of Staley High School in Kansas City, Missouri. She chose UA because she was impressed with the campus, especially the Shelby Engineering and Science Quad, and the numerous campus involvement opportunities available to students. 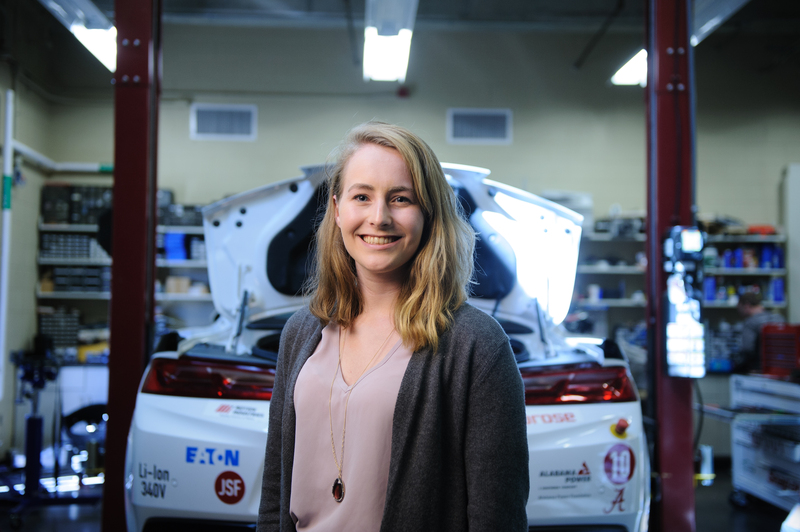 Now a master’s student pursing an MBA with a specialization in financial engineering, Loftis serves as UA’s EcoCAR 3 project manager. 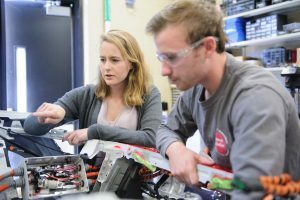 The EcoCAR 3 program is currently in its fourth year and provides students with an opportunity to contribute to the design of a hybrid-electric muscle car. Students collaborate in an effort to design the ultimate energy-efficient, high-performance vehicle. Loftis, left, talks with EcoCAR 3 team member Brandon Naber, a sophomore studying mechanical engineering and mechanical sub-team co-lead. Becoming project manager was no easy task. After applying, Loftis went through two rounds of interviews with student leaders and faculty on the team. She said she was surprised when she got the call informing her she was named project manager. “It’s been a unique experience that has allowed me to grow and learn much more than I could just in a classroom,” said Loftis. Loftis recently took home the annual General Motors Women in Engineering Award during the EcoCAR 3 Year 3 Competition. This award goes to women on EcoCAR 3 teams who demonstrate outstanding technical excellence and accomplishments. She became the second UA student to win the award, as Megan Hathcock took home the honor the year before. Going into the competition, she was worried because she had been with the team for less than a year and didn’t have much experience with automotive engineering. In her presentation, she focused on the professional development and technical skills she gained in EcoCAR 3 and how they could apply in other industries. It paid off. She became involved with the EcoCAR 3 program the first semester of her senior year. She chose the program due to her interest in power electronics and electromechanical systems, and what started out as a class project quickly turned into a hobby. In addition to her academic achievement, she has taken part in four separate internships with Burns and McDonnell, an engineering, architecture, construction, environmental and consulting solutions firm based in Kansas City. All four of those internships were in the company’s energy division. Loftis said she’s thankful for the countless opportunities UA has offered her and gave a lot of the credit for her success to the STEM Path to the MBA program. “During my time here, I’ve been able to make more industry connections, find mentors in faculty members and other students and gain experiences in a variety of fields beyond my major area of study,” said Loftis. Derek Hooper is a student writer from Huntsville, Alabama, studying public relations at UA.